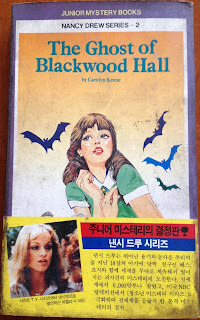 Around the World with Nancy Drew: Holy Grail: vintage Korean Nancy! Holy Grail: vintage Korean Nancy! 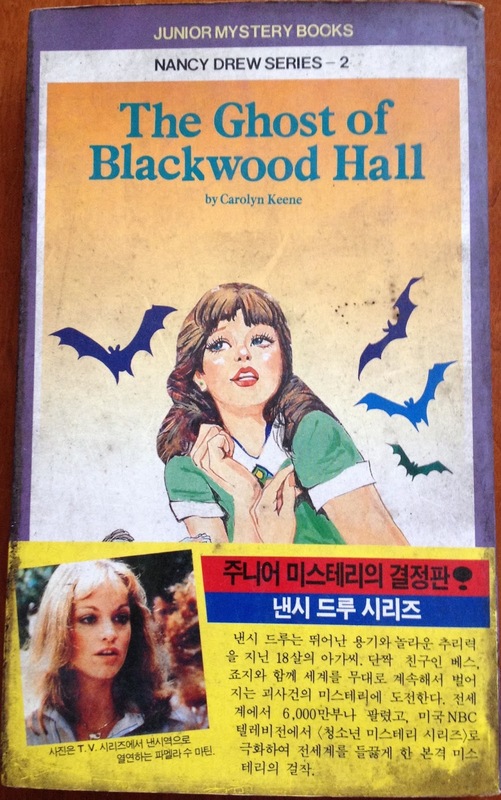 It's a red letter day here as I have finally acquired a Korean Nancy Drew from the classic series! I only include that caveat because I was previously able to get some of the recent Nancy Drew Crew Clue books in translation (and brand new), but that's not really the same thing. I have known of the existence of this format since 2010 but it has been very difficult to obtain any copies because of the scarcity of the books and the formidable language barrier. I was finally able to identify an agency in Korea that could play the middleman for me to acquire this volume. Ultimately I paid 1500% of the used book price to get it to me here in the States, but it was totally worth it! The book appears to have been printed in 1984 and it is a large size paperback, surprisingly thick at about 3/4". I believe the publisher is called Saesonyeon Four. It is very clearly stated on the back as The Ghost of Blackwood Hall (see second photo) and it has a little promo teaser on the back which mimics the dust jacket wrapper featuring Pamela Sue Martin from the Japanese Yomiuri books of the 1970s. The book designates Blackwood Hall as #2, using a whole new numbering system (in US it would be #25, UK would be #11 and in Japan it would be #8). There is a back flap to the paperback cover which seems to list 5 titles. I believe some of the other titles are Crossword Cipher, Swami's Ring and Kachina Doll as I have seen covers that appear to correlate with those titles. The 5th story is still a mystery! The artwork is original and if an illustrator is credited, it's in Korean so I can't share that information with you. It is similar to the UK "C" format in that there are disparate elements from the story that are placed in a montage with a giant Nancy figure at the center. 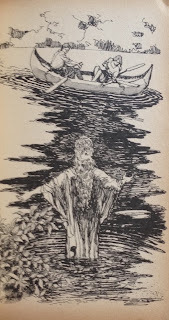 There are 4 internal illustrations which do not look familiar to me, i.e., I'm pretty sure they were created for this edition. 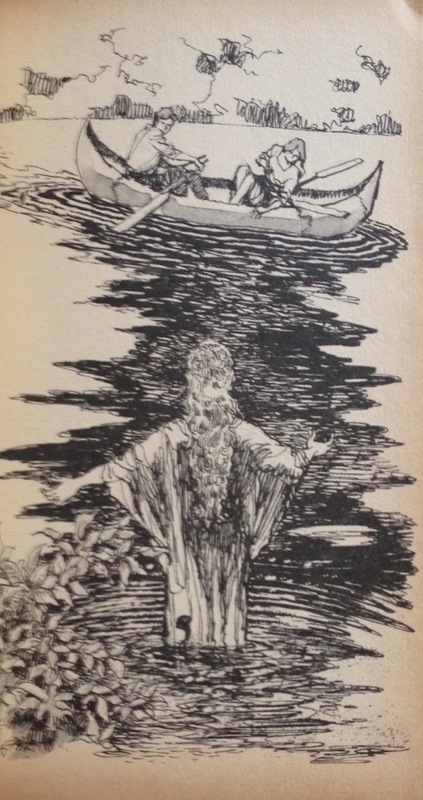 They are nicely executed line drawings - I am including the one where Lola almost drowns while Ned and Nancy are out canoeing. 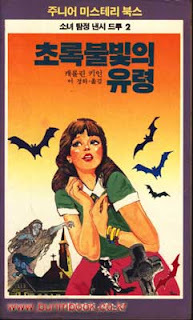 As I have conducted my research on Nancy Drew in Korean, these are the editions which seem to pop up most frequently. There appear to be other "one off" translations here and there from a variety of publishers. I am hoping someday to get some more Korean editions and will share my discoveries when/if I am successful.